Wether it is needed or not, when endurance watch companies branch out the outcome is usually good. Suunto has done just that with their Elementum collection. Bringing the bling to the enthusiast when they are not running, biking, hiking, camping or even fishing. These watches go deeper, higher, further and they do it with style, from the Aqua to the Terra and the Ventus, Suunto is sure to have a watch that will fit your style. Hey the Aqua even set a world record free dive with out fins, William Truebridge goes 86 meters, guess the watch works. Not all workouts are meant for the gym. Sagaform's kettlebell grill is keeping you honest even when you are away from the gym. Comes in pink, green and blue. Not much more to say, summers here. RealRyder, The New Way to Spin! Spin bikes have been proving themselves for many years, now you have RealRyder shaking things up. You have the traditional spin bike which is great but has trouble mimicking real world biking and balance. If you just want to get into shape great, the ones that need to feel the bike move how they are laying down power is there power equal on both side, the RealRyder will expose those weaknesses. Grease Monkey Wipes, Low Tech Solution, High Results! busted a chain, changed a tire and your hands are lets say a little dirty. Well Grease Monkey to the rescue. These packs store on your bike, messenger bag or car, when you get into a situation that calls for dirty hands, no more pants to bail you out. Grease Monkey Wipes are the premier individually packaged cleaning wipes for cyclists and triathletes. Each pre-moistened wipe uses a natural citrus-based formula to handle heavy duty cleaning, including grease and grime. Grease Monkey Wipes are perfect for cleaning up post ride or after a mid-ride repair and should be carried by roadies, mountain bikers, triathletes, cyclocross riders, bike messengers, and bike commuters. Keep Grease Monkey Wipes in your saddle bag, bento box, jersey pocket, post-race bag, transition bag, messenger bag, backpack, toolbox, workshop, or wherever you play dirty. new colors and 3 years going strong. Newton is coming into it's own and really taking hold not only in the USAT but also in running, marathons as well. The shoes are light, well build, fast and best of all the patented Action/Reaction Technology™. When using the ultra-efficient Land-Lever-Lift midfoot or forefoot running gait, the technology absorbs and then returns your own energy back to you. It's not fancy technospeak, and it's no gimmick. It's a revolutionary way of building a running shoe based on Sir Isaac Newton's third law of motion – "For every ACTION, there is an equal and opposite REACTION." Loosely translated, it means you get a boost of forward energy with every single stride you take. Wearing the shoes will get you noticed and for very good reason you will be going fast. The stand out, neon yellow, go fast red and orange are the best thought out marketing that one has seen in a while. They also have the shoe test results to back it up. They make some of the fastest wheels around ZIPP has now added tires to compliment their wheels. "To cut through the wind, we've used our patented ABLC dimples to mitigate the "un-aero-ness" of a round shape at the wheel's leading edge. It took us 14 months and 2 trips to the wind tunnel to get it right, but the dimples will save you 1-3 watts, or up to 9 seconds over 40km. That's a big deal. But the Tangente is not just a delicate special event tire. Thanks to our partnership with Vittoria, the Tangente sports a durable yet supple 290tpi casing. Because the dimpled pattern resists cracking so well, we're able to use an exclusive an extra-light rubber compound for low rolling resistance and high cornering grip in wet and dry conditions. The Tangente's 21mm width optimizes aerodynamics, cornering ability, and durability. Average weight 282g, /- 15g. 38mm, overall length, approximately 34mm functional length. Includes tire pressure chart to optimize rolling resistance by rider weight and front/rear use." With a wheel set why would you not buy the tire that matches or is at least designed for their wheels. Seems like a know brainer. The fabric doesn't matter, its all in the draw string. Kids pant have this waistband that is adjustable so they can were bigger sizes without the pant falling down, not sure why this was abandoned but it seems as though Imperial Motion has solved this problem. No more showing crack, the draw sting looks like any normal draw string would look like on a boardshort except it goes all the way around your waist like when you were a kid. The only problem is the choices or styles to choose from, you can't win them all. As with all technology things get smaller and cooler. Like a smart phone that can take ultrasound pictures. Imagine emergency response with these type of gadgets, police officers who arrive first that the scene. Yanko has some of the best ideas around. 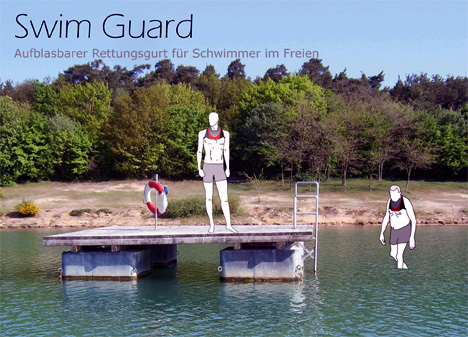 Swim Guard Vest is a vest that is worn like a Chest Harness with a bit more support around the neck, keeping your head afloat. The device is form fitting and I could see this being built into wetsuits in the near future. The really cool feature is the GPS that is built in. I can see Triathlons offering this as an options to those a little hesitant of the water, like theNew York City Triathlon, the Hudson can be scary. Map Out Cycle Routes In Advance! Sometimes all it takes is techno, gadget guy to get into exercise and WHAM you have another cool device. 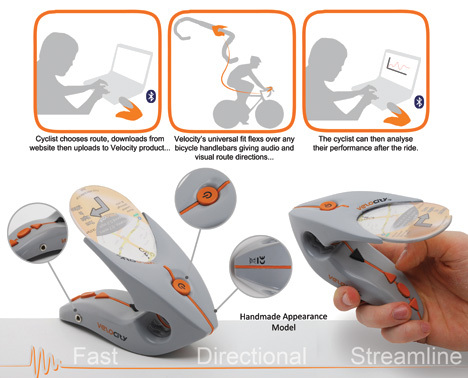 The neat gadget clamps up to the handle bar and includes audio as well as visual guide. You simply need to hook up the device to your comp and download the desired route from an online map. Turn by turn, the VeloCity rattles of the directions and simultaneously displays the map on the screen. Of course GPS and Bluetooth come into play as well.